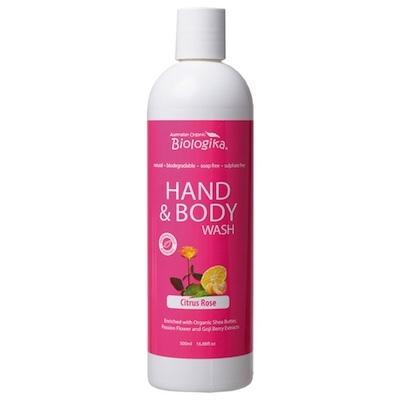 Hand & Body Wash therapy range, enriched with Shea Butter, Passion Flower and Goji Berry Extracts. Available in 1lt, 500ml and 250ml with pump. Organic Shea Butter easily absorbed by the skin it has protecting and smoothing effect, rich in vitamin A and E it helps in retaining elasticity of the skin. - Organic Passion Flower extract added for its relaxing properties. Goji berry extract, known to have the highest source of antioxidant of any fruit and vegetable in the planet, as such it is regarded as an essential ingredient to help keep the skin fresh and young. A gentle formula for everyone to Enjoy!! Directions for Use: Apply a small amount directly onto your hands and/or body, or on a sponge, gently massage your hands and/or body and rinse. Ingredients: purified water, organic coconut oil, decyl glucoside, organic shea butter, organic aloe vera extract, organic passion flower extract, organic goji berry extract, xanthan gum, rose geranium pure essential oil, organic mandarin red oil, olive leaf extract, potassium sorbate and citrus seed extract.